'Percenta Nano Wood & Stone Sealant' is an aqueous inorganic-organic coating material that uses nanotechnology. Anti-adhesion components provide an invisible water resistant and oil resistant film on surfaces. 'Percenta Wood & Stone Sealant' can be used on absorbent and porous surfaces. Use 'Percenta Wood & Stone Sealant' as an invisible and multi functional impregnator for all porous surfaces. After one treatment, an invisible, dirt-resistant and UV stable coating develops. All porous surfaces can be protected with nanotechnology. 'Percenta Nano Wood & Stone' is free from silicone, wax and oil. The breathability will not be reduced after repeated treatments. 'Percenta Nano Wood & Stone' will provide the maximum effect after just one application. No other sealant products are required. Wooden tables, lean-to garages, verandas, fences etc can be protected against dirt, dampness and moss. However, the product cannot be applied to freshly painted/varnished wood (three months drying time should be allowed). 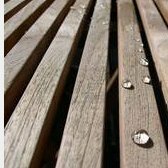 Nano sealants should not be used on oiled wood or teak, which can become spotted. Every friend of plants would be happy if their plant pots remained dirt-resistant. Flowerpots keep their original colour when our nano sealant is used. Stones used for making, for example; gravestones, often have to be looked after as moss can adhere quite easily. Sealing stone surfaces avoids adhesion of dirt, loam and moss after the use of our nano wood & stone sealant. It's sufficient to clean only with water to preserve the stone. Natural stones including marble, used decoratively in gardens should be protected for the long term. Whether gravestones, monuments or stone sculptures, with our nano sealant all stones used outside can be protected against weathering and moss. Houses built with asbestos cement offer a great adhesion for mosses and dirt. The facades soak up dirt, which is difficult to remove. The sun also burns the dirt into the surface, which leaves permanent staining. An ideal protection is our stone & wood sealant. Year on year roofing tiles and walls get greener. Such surfaces can only be cleaned with a high-pressure cleaner. Month on month moss and dirt adheres to the surface. 'Nano Wood & Stone Sealant' prevents discolouration of external walls and tiles. White stones like sandstone or breeze blocks need to be especially protected. The stones soak up dirt, oil, grease and other contaminants, which are difficult to remove, even with a high-pressure cleaner. An ideal protection will be our 'Nano Wood & Stone Sealant'. The breathability remains, but contaminants can no longer adhere anymore. External walls are always exposed to the elements. As a result the most exposed side often has a different colour to the rest. When all the sides are sealed, dirt cannot get through to the masonry. The house remains the same colour all over, for longer. Our 'Nano Wood & Stone Sealant' provides optimum protection against weather and contaminants in the garden or around the home. Discolouration of the paving stones/tiles due to dirt, moss, grease and oil belong to the past.